Properties in Windsor Lake Park average 4.7 out of 5 stars. Hidden gem at base of ski mountain. Property 17: Hidden gem at base of ski mountain. Beautiful Southern Vermont Farmhouse on 100 Acres, Spectacular Views, Swim Pond! 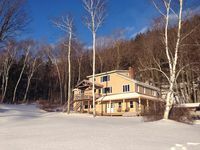 Property 19: Beautiful Southern Vermont Farmhouse on 100 Acres, Spectacular Views, Swim Pond! 1,000 SF PRIVATE GRD FLR APT, 5-STAR STAY FOR 3-STATE VISIT! Property 20: 1,000 SF PRIVATE GRD FLR APT, 5-STAR STAY FOR 3-STATE VISIT! Spacious Wilmington Home w/ Game Room & Deck! Property 27: Spacious Wilmington Home w/ Game Room & Deck! 3 BR/2 Bath Post and Beam - Next to Haystack Golf Course. Property 28: 3 BR/2 Bath Post and Beam - Next to Haystack Golf Course. 4 BR, 2BA: Comfy, Clean & Family Friendly - 15 mins to Mount Snow! Property 34: 4 BR, 2BA: Comfy, Clean & Family Friendly - 15 mins to Mount Snow! Village Gem! Park your car and walk to Shelburne Falls! Property 36: Village Gem! Park your car and walk to Shelburne Falls! Spacious 5 Bdrm A-Frame: Walk to Lake Raponda. Wooded Setting. Ski Mount Snow! Property 41: Spacious 5 Bdrm A-Frame: Walk to Lake Raponda. Wooded Setting. Ski Mount Snow! Thank you Tony! We had such a wonderful weekend away. Quick drive to Mt. Snow, restaurants and the grocery store. The house couldn't have been any cleaner and the views were amazing! Thank you for opening up your home to us. We will be back! Our host, Molly, was warm and welcoming, we had everything we needed in our room, and she offered a great selection of food for breakfast. Highly recommend! !